CBS Alumni Day 2018 was held in fierce competition with a hot and sunny summer day on Thursday, 24 May. 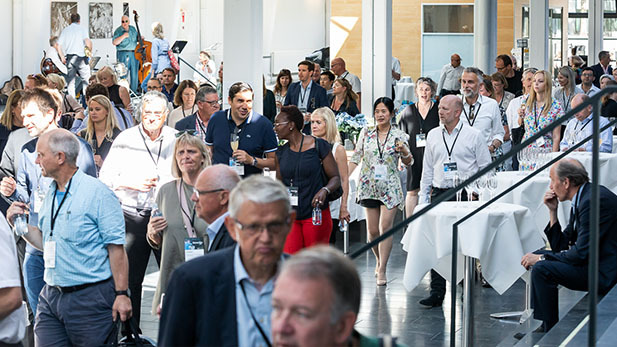 The alumni were welcomed at the door in ‘Porcelænshaven’ by CBS’ Senior Management Group. The Kiln Hall buzzed with the sounds of happy reunion, and it was only when people were listening to the official programme that there were any breaks in the conversation. A group of alumni accepted the offer of taking a tour of CBS’ campus. 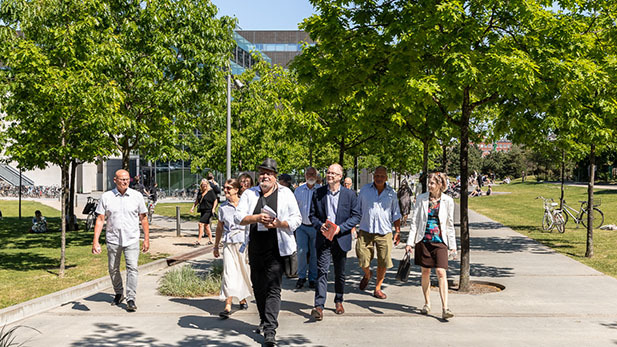 The trip from Solbjerg Plads through ‘The Wedge’ (Kilen) to the old raw materials warehouse (Råvarebygningen) in Porcelænshaven (overlooking Frederiksberg Garden from the roof terrace) had small detours through CBS 'development throughout history. It was not due to any lack of inquisitiveness that the group arrived just in time to register. 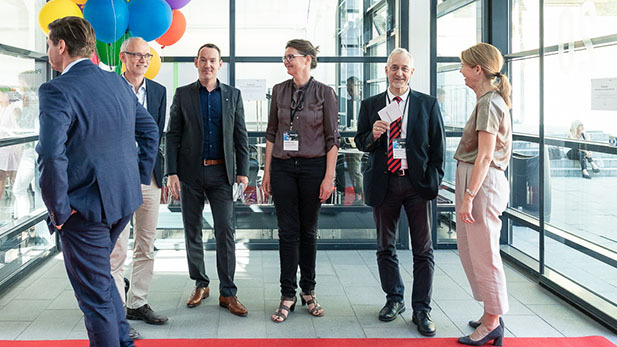 CBS Senior Management Group (from the left) – Dean of Research Søren Hvidkjær, Dean of Education Gregor Halff, University Director Kirsten Winther Jørgensen and CBS President Per Holten-Andersen (here in conversation with this year's Distinguished Alumna Lise Kingo) bid the alumni welcome at the door. 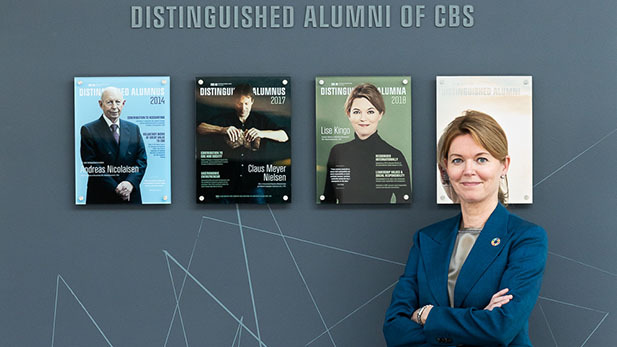 Host of the Alumni Day, CBS Business Director Louise Seest, was excited to meet so many of CBS’ alumni. 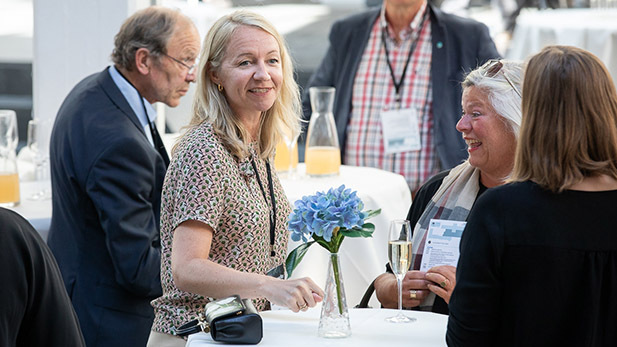 Between holding the welcome speech and fulfilling her role as host, she networked intensely through the day – and she was far from the only person to diligently make new acquaintances throughout the event. The alumni who participated in Alumni Day 2018 ranged from the newly educated to the long retired. The resulting diversity gave rise to surprising and enriching insights and perspectives, as participants through the event followed the requests to briefly discuss the various subject with unknown table companions. The alumni were also happy with the year’s initiative of dropping the rows of seats and having them sit comfortably around tables during the official part of the event. 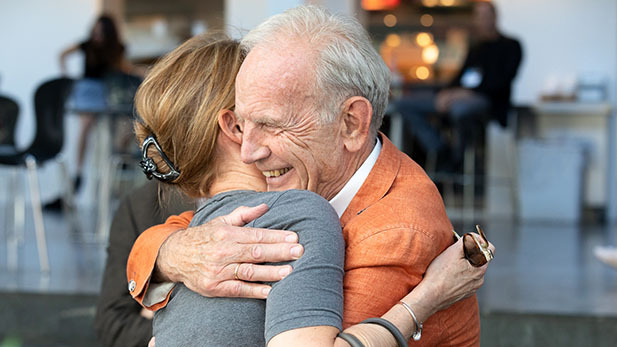 In his annual alumni address, President Per Holten-Andersen emphasized that CBS did not work to gather the alumni at events like these in order to ask for money (at least not yet) but in the hope of getting alumni actively for the benefit of not just CBS and its students, but also of the alumni themselves. Lise Kingo from Novo Nordisk's Executive Board, currently CEO and Executive Director of the United Nations Global Compact, was honoured with acclaim as this year’s Distinguished Alumna. Her subsequent key note speech, 'Sustainable development from a business perspective - confessions of a change agent', inspired the audience and led to several questions from the audience. The speech focused on her personal role models and how the alumni, as leaders and change agents themselves, can contribute to realizing the UN's global goals for sustainable development. 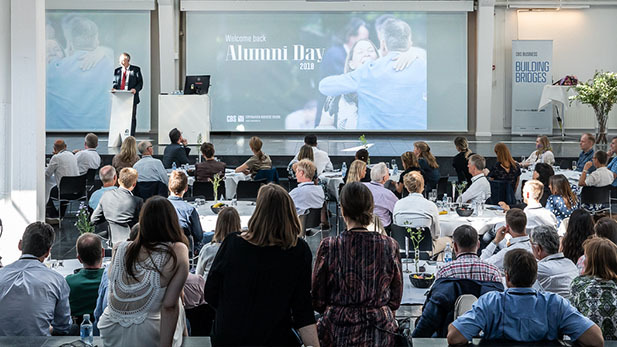 Lise Kingo's former mentor and boss, former CEO of Novo Nordisk and today adjunct professor at CBS’ Department of Management, Society and Communication Mads Øvlisen, attended the Alumni Day and congratulated her heartily. 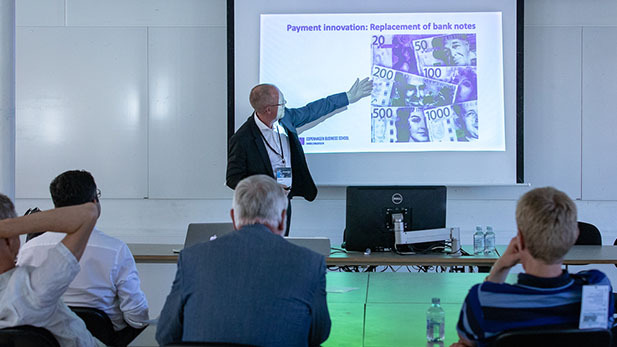 Associate Professor Jonas Hedman from the Department of Digitalization's presentation: 'FinTech Revolution: Cash is dying. What does the future hold?' offered a swift review of the historical development of means of payment reaching from barter to today's abstract exchange of values and currency. The thoughts about what perspectives digital payment options and smart money, such as earmarked public payments, may have for society, made the experience topical and relevant. Thanks to the very engaging researcher, the interest and desire to ask questions and examine the perspectives was high, resulting in a lively and nuanced (and critical) discussion that engaged the audience so much that the mutual discussions continued all the way down to the evening’s buffet. 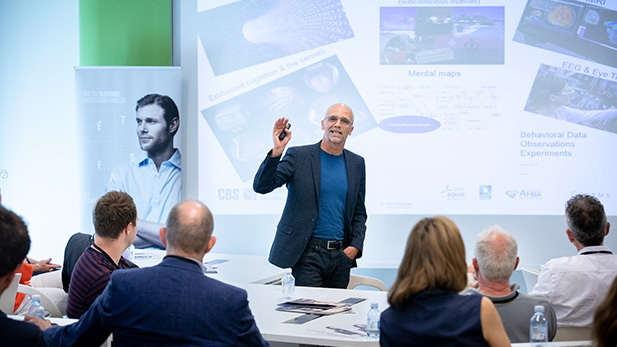 Professor Thomas Ritter from the Department of Strategic Management and Globalization, Professor Torsten Ringberg from Department of Marketing and Professor (mso) Sof Thrane from the Department of Operations Management focused on computer-driven business development. The audience’s interest and engagement was ensured from the start as they had been sent a questionnaire about the needs, capabilities and challenges of their own organizations when they registered. It was extremely relevant to have the gap between the importance of collecting, understanding and strategically utilizing data and the organizations' ability to exploit these held up against each other by an expert panel. It certainly ensured a lively discussion that continued for long after the session through the buffet. "I am so grateful to continually come back to a school that constantly renews itself, which helps me to maintain my hunger for new knowledge. That is what CBS offers. Today I chose to hear about the term 'andetgørelse'. I had no idea about the existence or meaning of the word. That became clear to me today. "